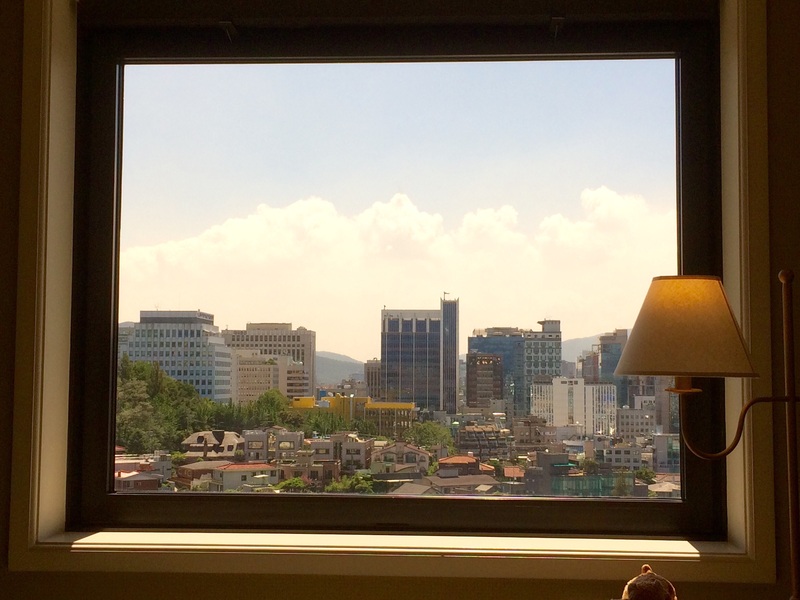 Good morning Seoul! 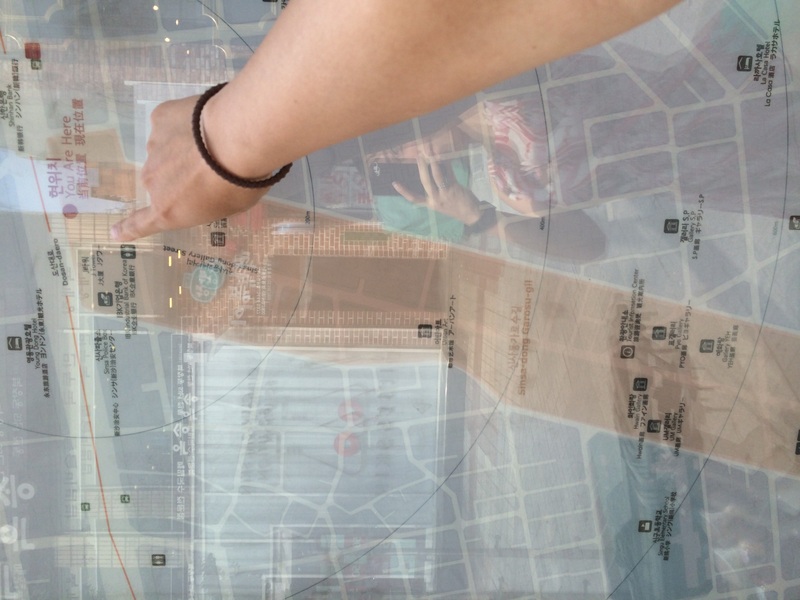 Pretty as a picture..
Wandered Garogusil, a shopping street in Gangnam. Wasn’t terribly impressed, maybe I’ve been shopping too much..
At Take Urban: apparently, if you show up just before breakfast ends you get tons of carbs with your coffee order (a.k.a. Free “smile time”). 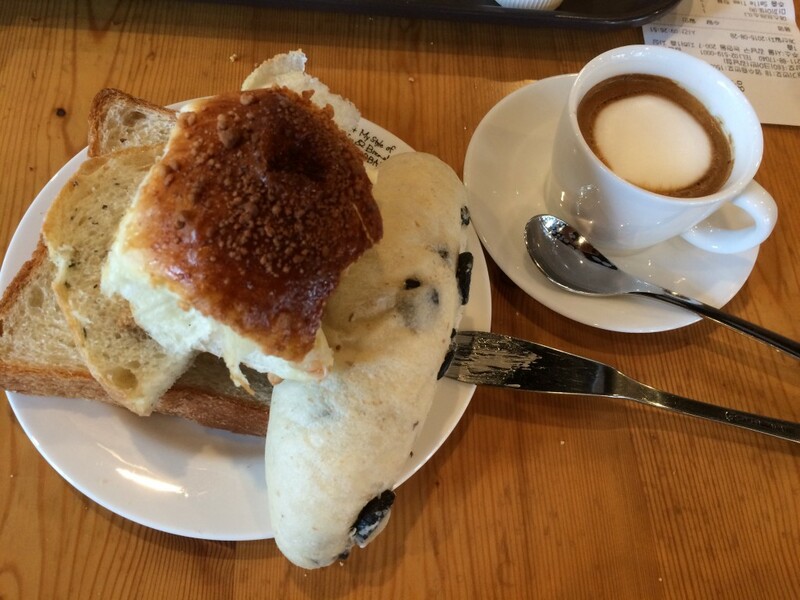 That’s olive bread on the right. 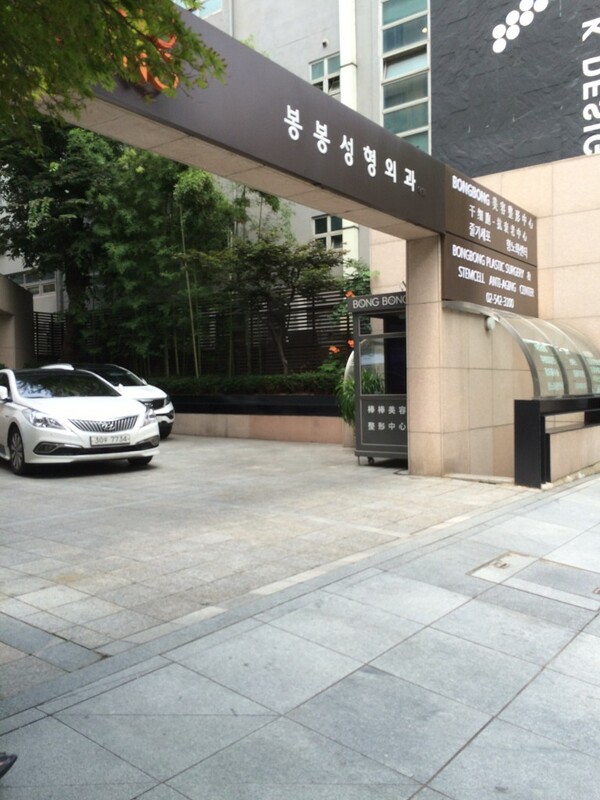 In Gangnam: a big fancy plastic surgery shop. Wow. 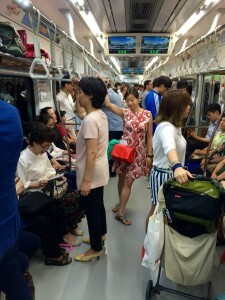 On the subway! A little excessively proud of having obtained a T-Money card (well, a competing product) to pay for the subway. 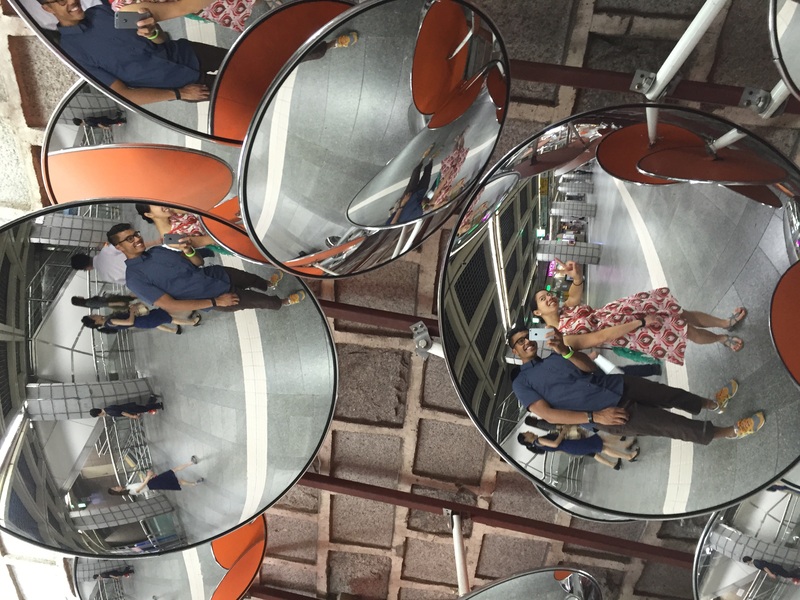 Fun mirror art for silly tourists. 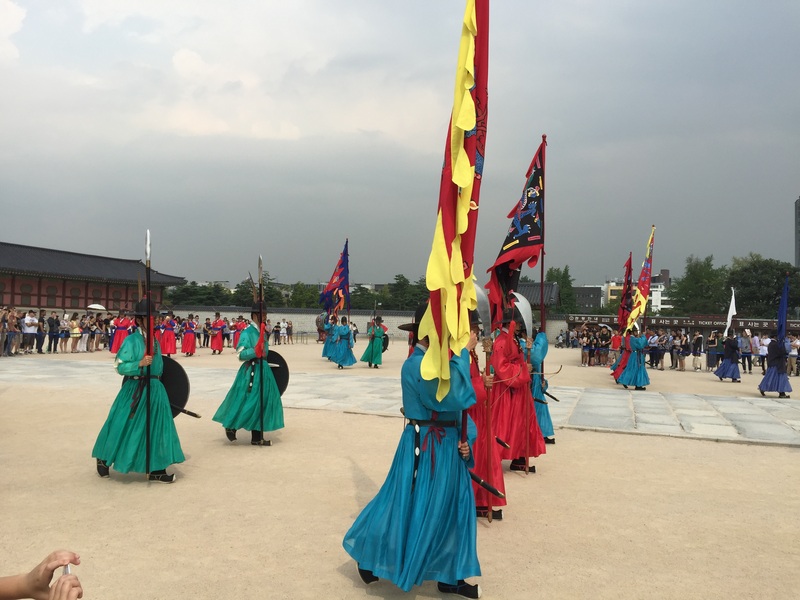 At Geongbokgung Palace: these gents march around in costume in the hot, humid sun for a sense of going back in time. Kudos. Next to the marker for “bureaucrat #1” who would stand there to receive people if they didn’t see the lower level bureaucrat numbers two through nine. 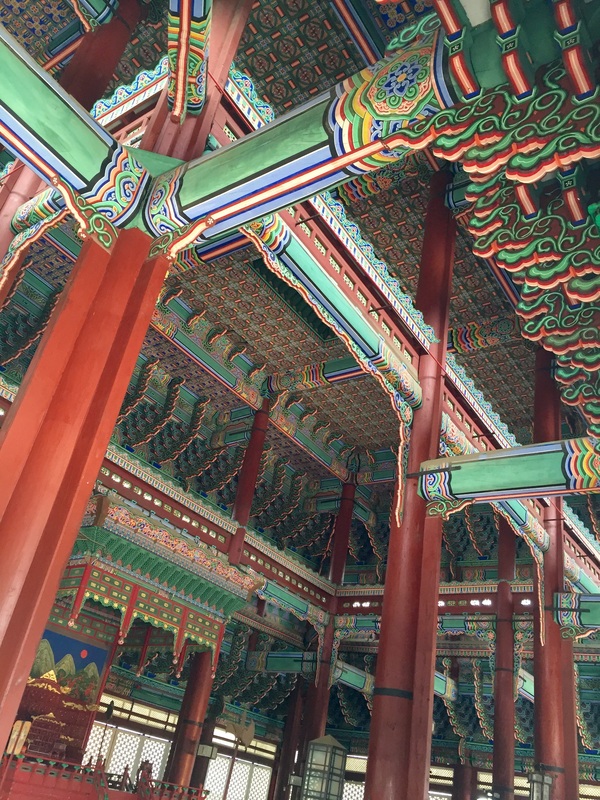 At Geongbokgung Palace: throne room ceiling. 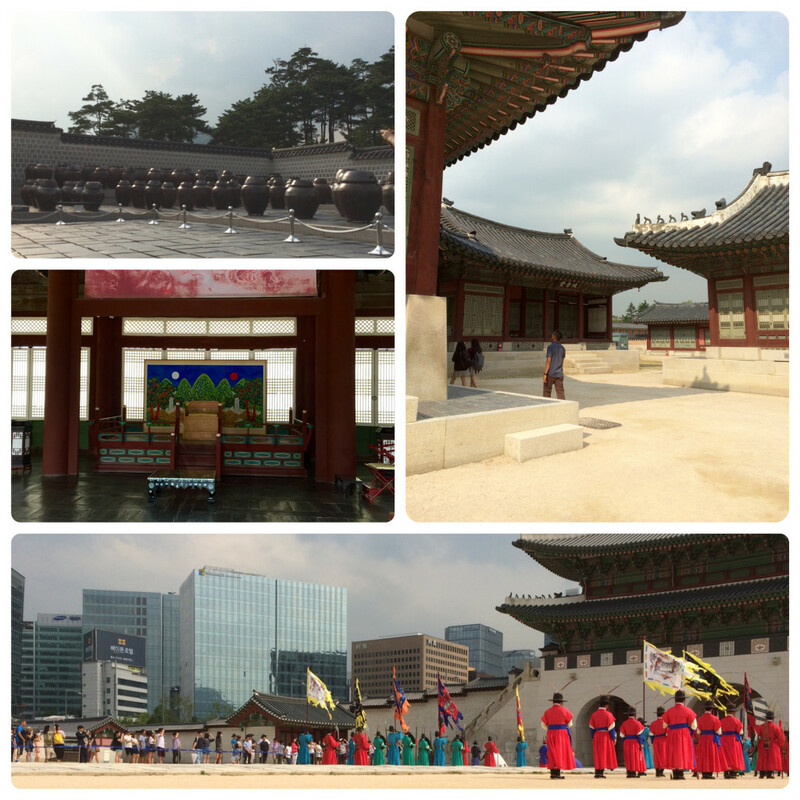 At Geongbokgung Palace: top left: food storage and fermenting area, right: palace grounds, bottom: entrance courtyard, middle left: royal throne! 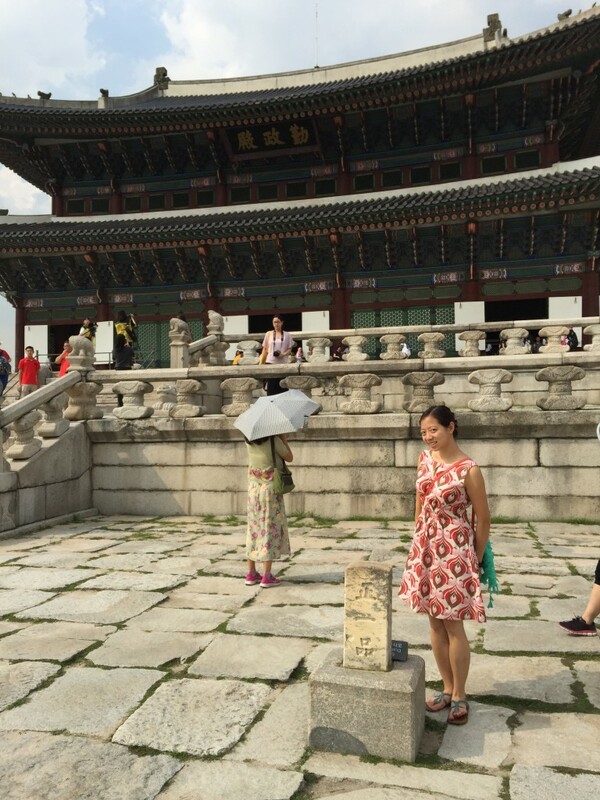 At Geongbokgung Palace: age-old man-made pond and structure. 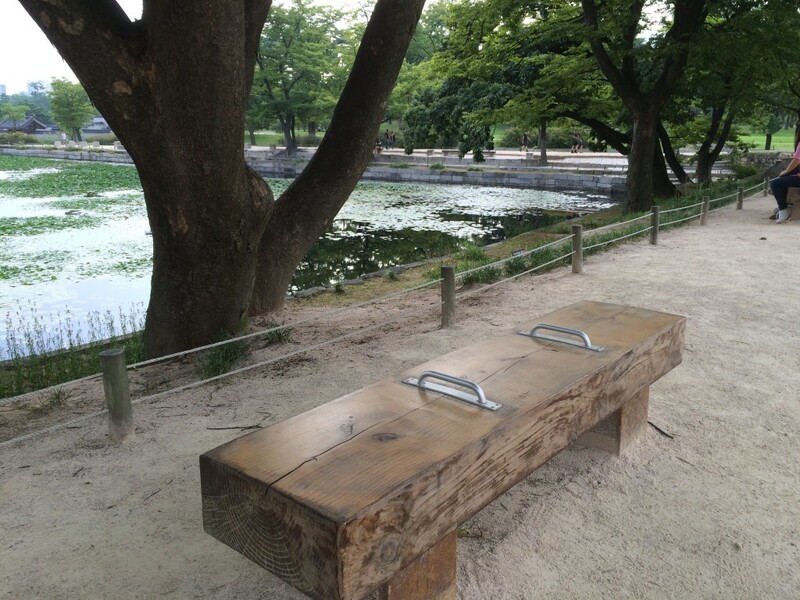 At Geongbokgung Palace: looks like the Koreans know a good napping bench when they see one too, just like in Seattle. 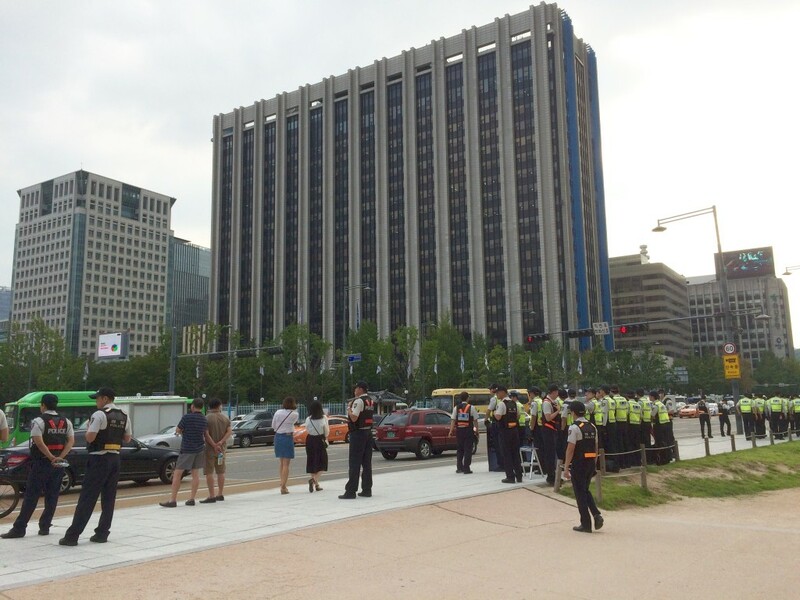 Outside the palace: not sure why there were tons of fresh-faced police swarming here..
Will Call Attendant: Hmm, is your name Park? Will Call Attendant: When is your birth date? 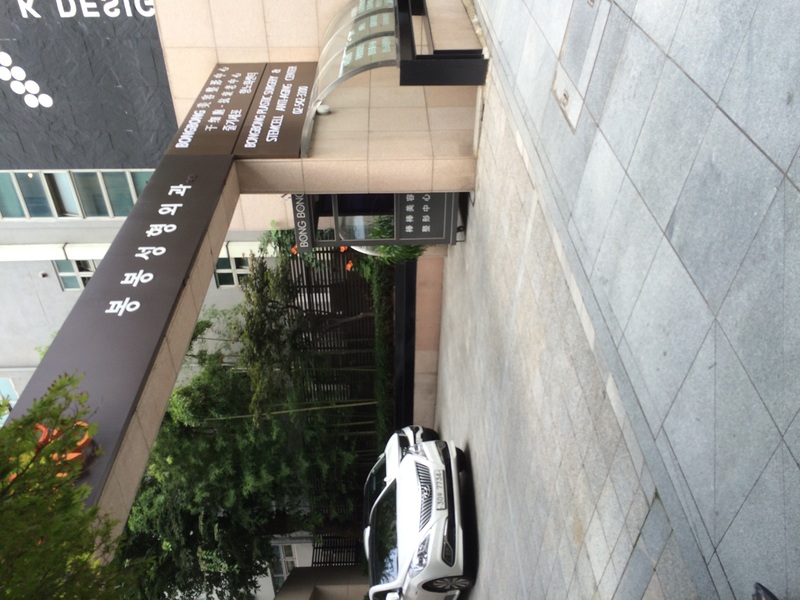 Me: Well…S______ Park reserved the tickets for me. Will Call Attendant: Do you have her phone number? Will Call Attendant: Aaaah, the hotel reserved the tickets for you? ..Phew! Was looking dicey for a minute there! Founds some KS Wyverns vs. LG Twins playing baseball! 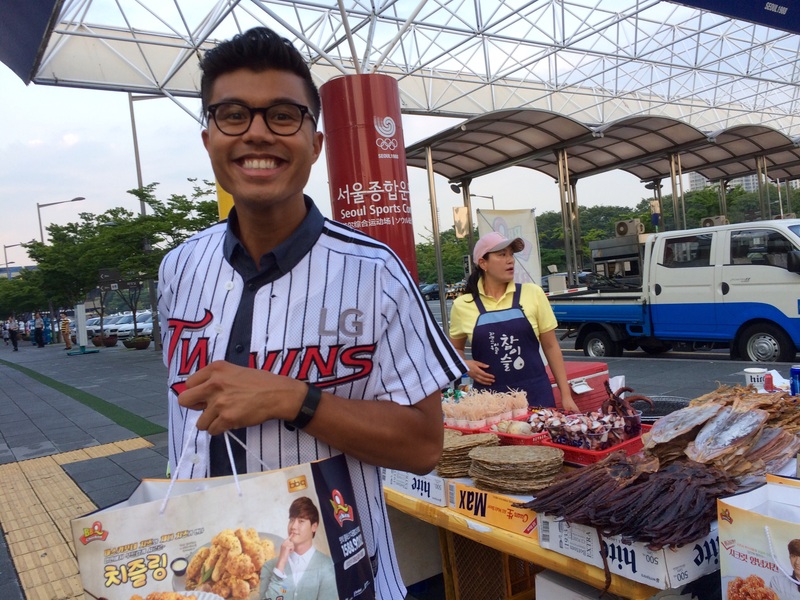 Had to stop for some fried chicken next to the squid. 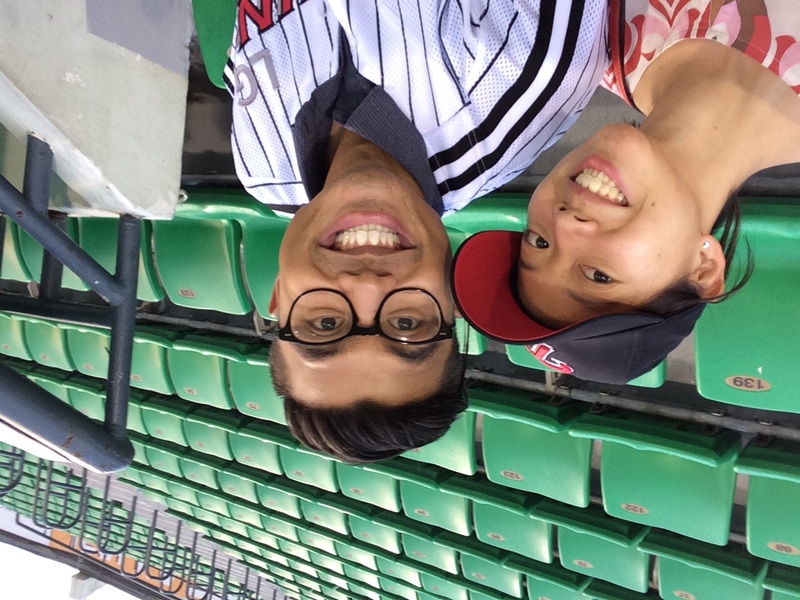 So excited for the game! 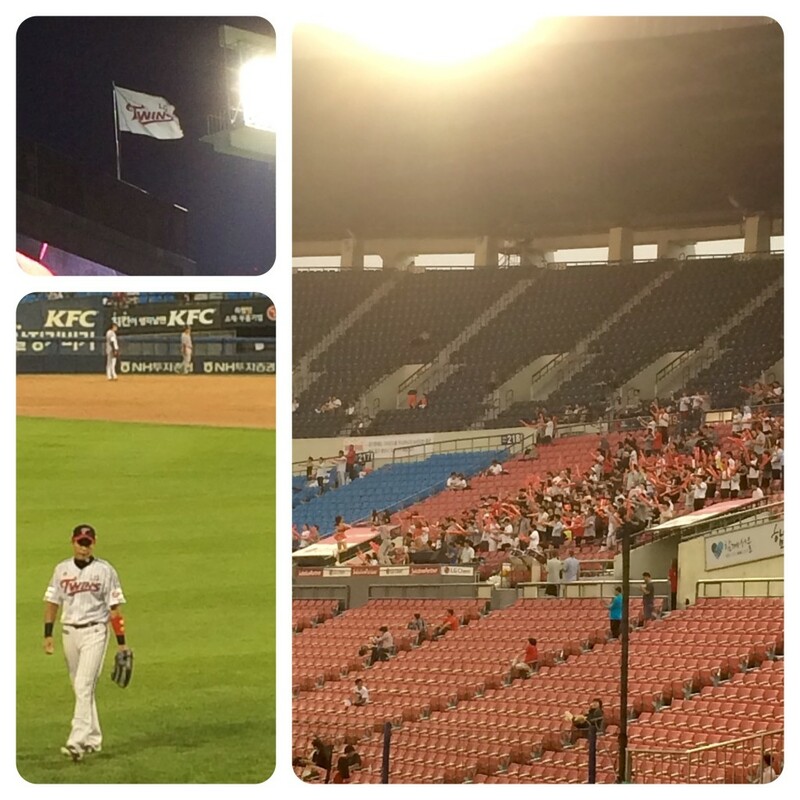 and the constant cheering! 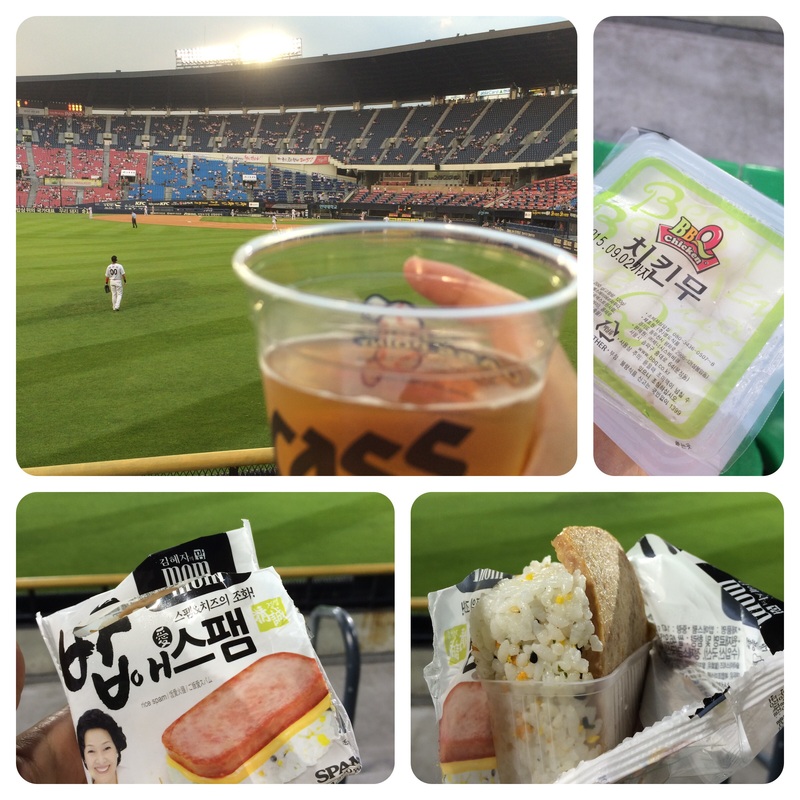 Too bad the LG Twins lost..
Beer was good, spam musubi looked good, until I opened the package…some how the more normal ham color put me off. 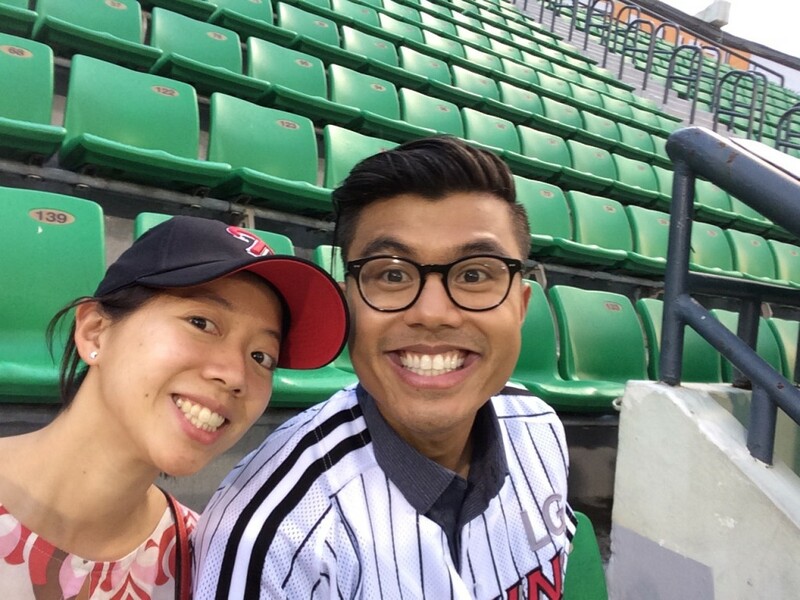 At the LG Twins v. KS Wyverns game! 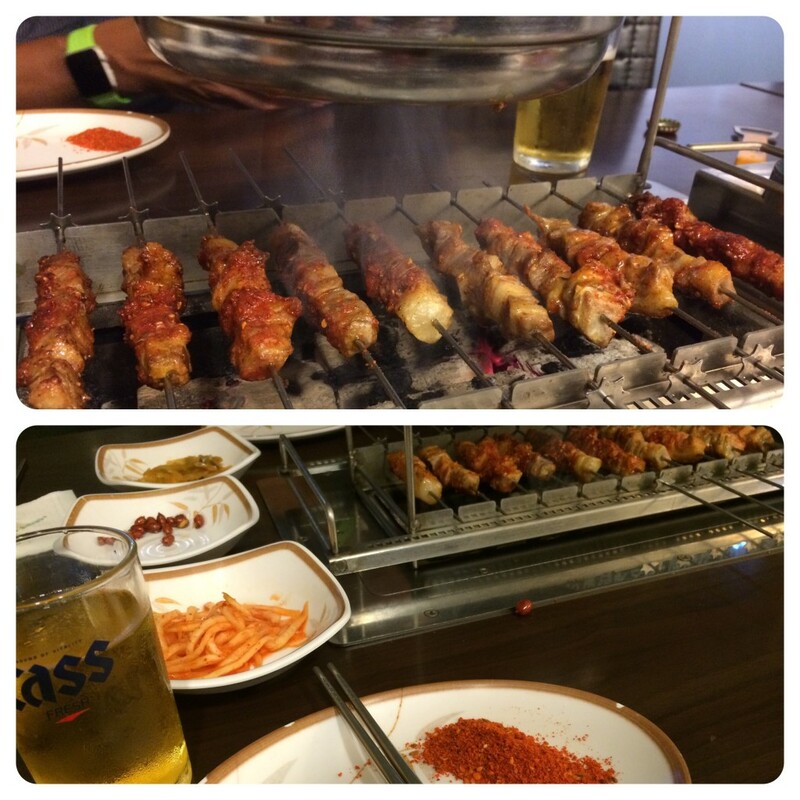 Pork skewers for a late dinner, slowly rotating on the spit, nom nom nom. 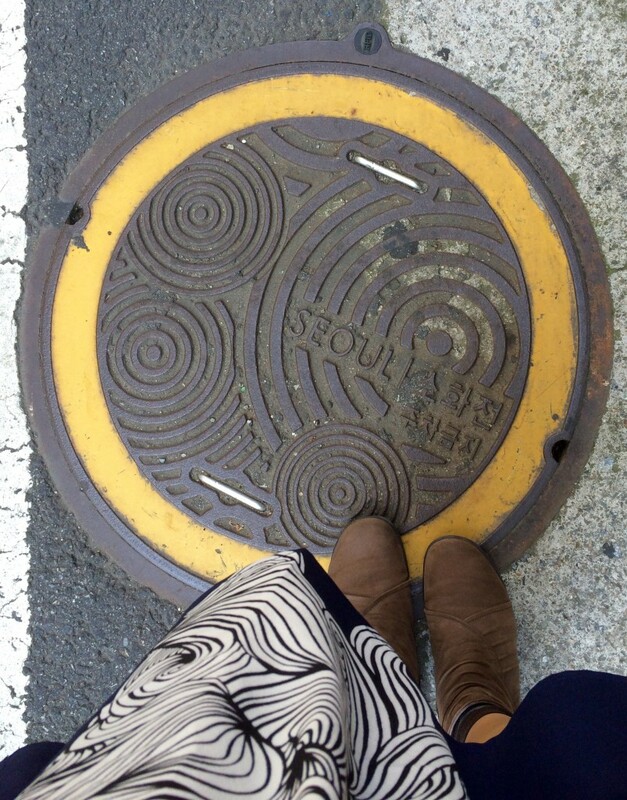 Proof of having been on the streets of Seoul: sewer cap art. 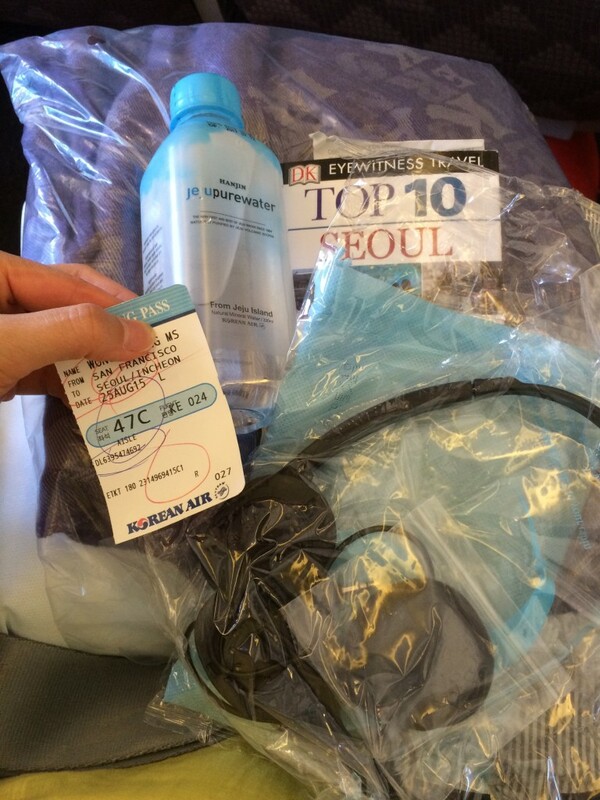 Korean Air still gives their economy class passengers “free” things! Water, slippers, and a toothbrush and paste. I guess if I were so inclined, I could’ve stolen the blanket and headphones too.. meals were standardly edible, excepting the delicious beef-filled bun I chose over a brownie. Best choice made on the plane. 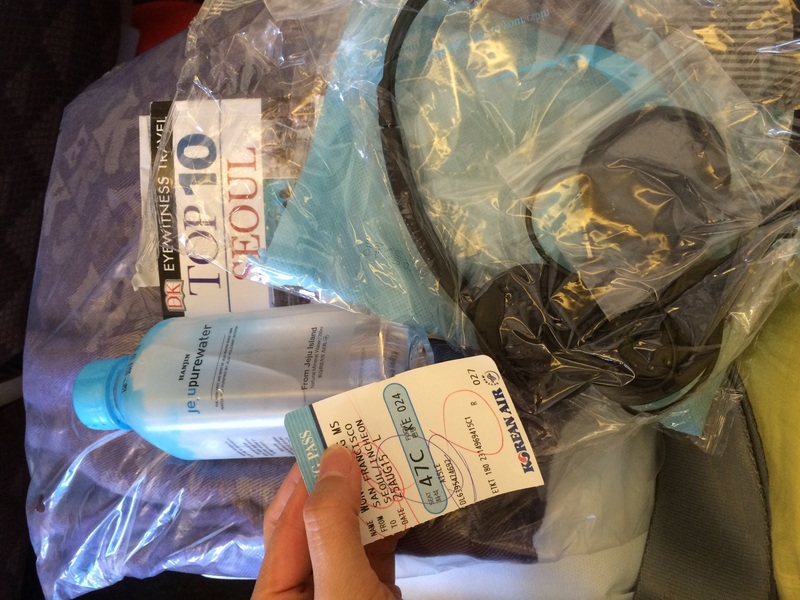 Korean Air: still providing ‘free’ things in Economy Class! 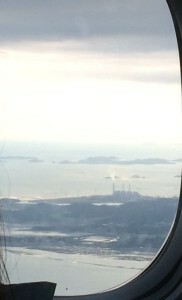 View from the plane into Seoul. 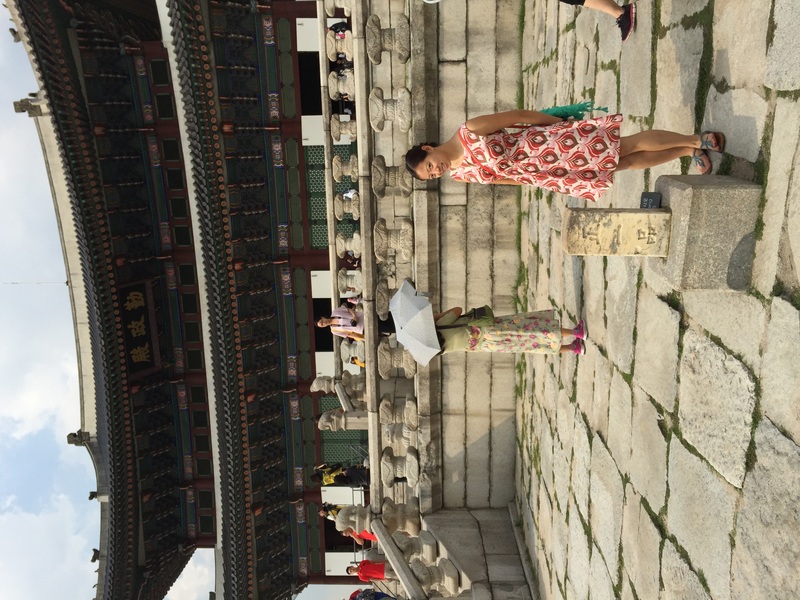 Exploring in Seoul! Day 0..
Now for a departure from the standard format I’ve laid out: for the next weekish, this is now a travel and food blog. Don’t worry, there’ll still be lots of food, I can’t resist! For any potential house burglars: I’ve got house guests living at my home in Seattle, and a home security system. First stop: SFO. I made a brief pit stop to visit my sibling and his family. Here’s a group selfie, it was the kids’ first day of school! Apparently, these days they let you out early on the first day, and you get to pick your own school lunch every day. What luxury. 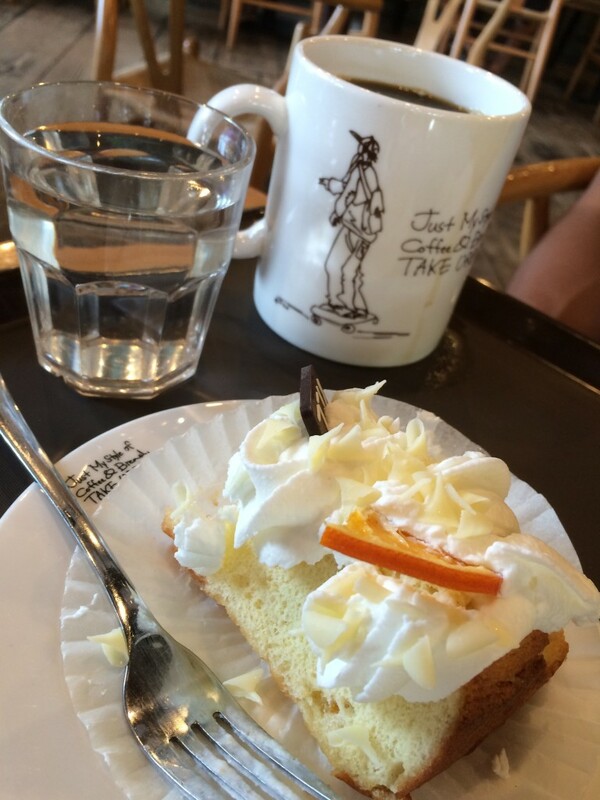 For more food clips, take a look at the instagram feed to the right. Had a nice joint dinner endeavor with my brother. He made lasagna, I made my standard green beans, and threw in an ad hoc peaches and cream dessert. I think the lasagna won. Also, I’m skipping the rounded corners. Let me know if you miss them, but it saves on processing/turnaround time. in a Dutch Oven, by Fire! 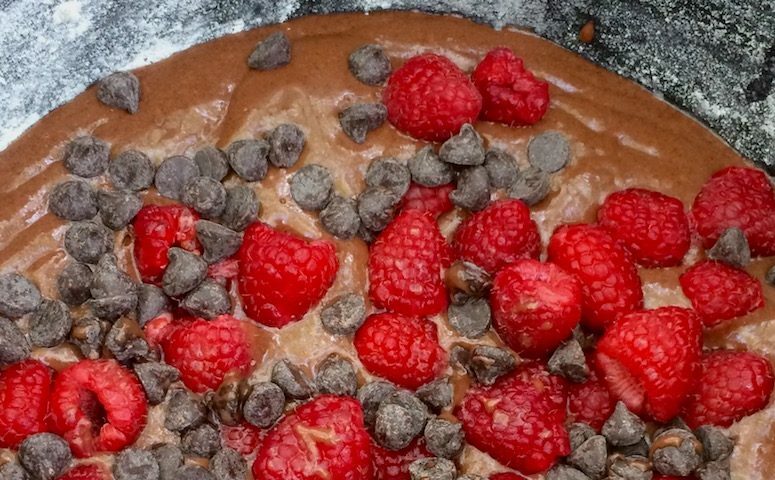 I found this gluten-free chocolate cherry cake recipe and used it to make a raspberry chocolate cake in a dutch oven by campfire. Below are the basic steps re-written the way I did them. This was a good one to prep and fire up before dinner, and let sit and finish cooking while you eat the main meal. 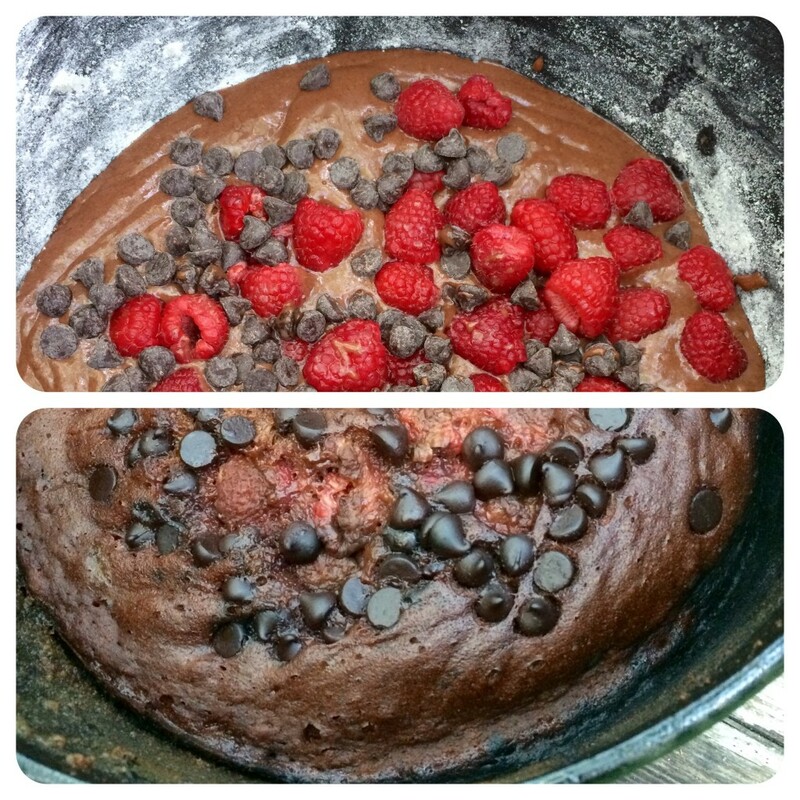 Raspberry chocolate cake batter: before and after. Packing bin of non-refrigeration items for high-maintenance car camping: cooking oils and vinaigrettes are quarantined in a brown paper bag. Method Part 1: Pack it! 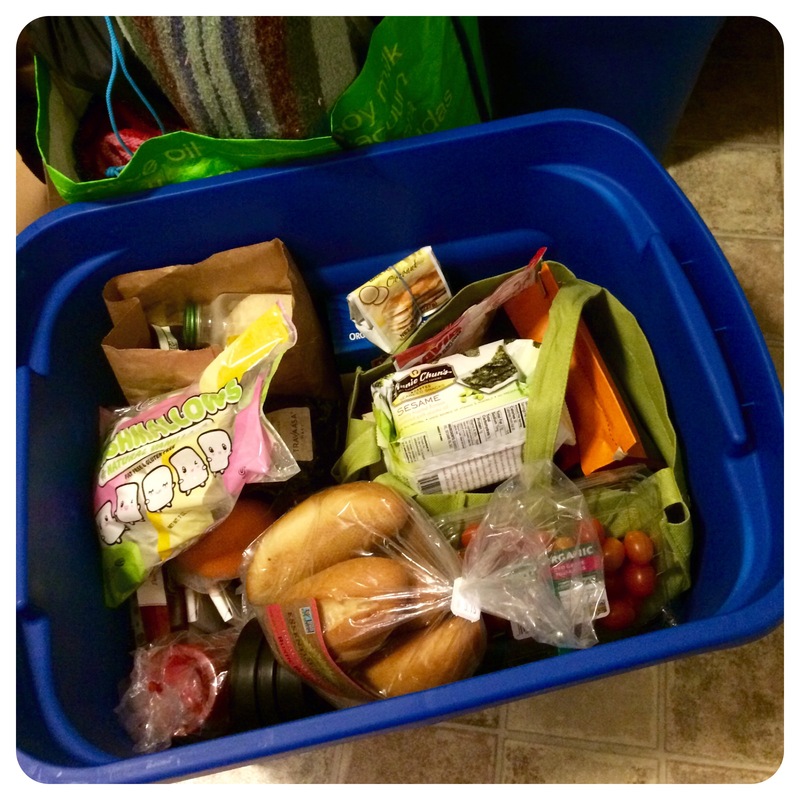 If you were a compulsive planner like me, you might list what you’d like to eat on your camping trip, and portion out ingredients as you pack up the accompanying junk food (in my house any road trip merits a hiatus from healthier eating). This time, I had in mind.. In retrospect, it was too much in one night’s work to prep everything and also make spam musubi, but yeah, that’s what I did (even with lots of help from K___). 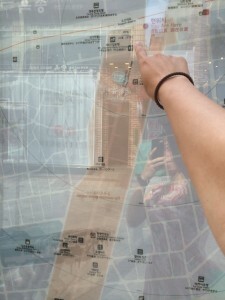 If you are NOT a compulsive planner like me, I leave it to you to wing it like you do (i.e. like a BOSS). Really, I only measured things out for the first two items listed there, and I cheated with box chocolate cake mix. 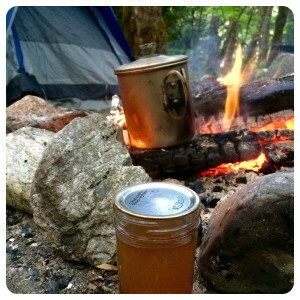 It’s camping, not the Iron Chef. I also made a little mix of balsamic vinegar and olive oil which came in handy as dressing and marinade. 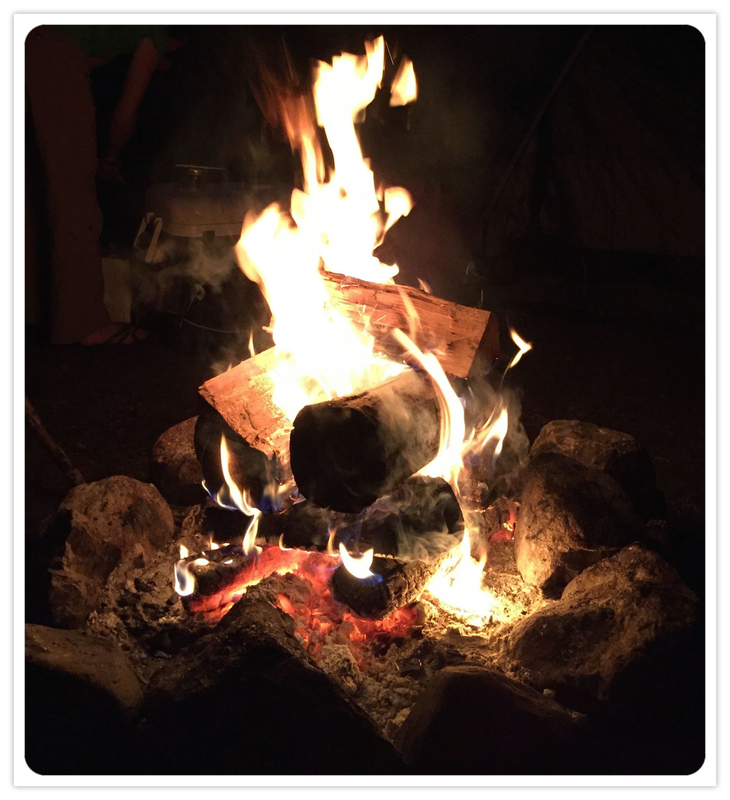 Method Part 2: Fire, not for backpacking -especially in high-fire-prone areas. With the exception of marshmallow roasting, you want a low, even fire with plenty of coals. K____ and I treated fire-building like a team sport, with him as captain. We spread the logs out pretty wide for cooking, to make room for an even surface for the tools. Want more on this? Let me google that for you... Don’t forget to read up before you are out of cell phone reception zones. Obvi, if you are backpacking, all this “camping” is a whole different ball game. -Needs: high temp cooking oil or butter, don’t forget the metal flipper! -Good for bacon and all-purpose random cooking, especially when you snag the last possible campsite and it turns out to have no standard grill rack. -Obviously a bad idea for for light-weight packs. Cast iron skillet in action! Served with a side of beer from a faraway place. -Good for making cake, probably good for a lot else too, like stew. It really holds the heat in. -Bad for your back. This thing is so heavy. At least that means the squirrels can’t mess with it, only Yogi Bear. -Good for..tubers, if you can get coals. Much better to wrap potatoes than expose them in cooking on a skillet. It was useful to shape handles on top of them for easier maneuvering. -Also good for fashioning makeshift plateware and utensils, for that one time when you forgot sporks. If you put the pre-mixed toddy ingredients in a glass jar you can heat it up near the fire to melt the honey before combining with water from the percolator. Tool 4: Percolator. Just add water! –Hot toddies (basically, pre-mix everything but the water and lemon). -Easy mac & cup noodle. -Thermos + raw chicken noodle soup to cook over time. That’s right, folks. While I’m grateful for the delicious breakfast K___ served up via skillet, and the fully-baked cake thanks to how well the dutch oven holds heat in, the percolator was the one I was most grateful to have, both to stave off a caffeine headache in the morning with coffee, and to keep me really cozy in the evening with hot toddies. It also felt like the easiest, most versatile one with endless possibilities. Maybe my opinion is swayed too strongly by how precious having water was on this trip since they hadn’t turned on the taps on the North Cascades yet. Oops. Second Runner Up: Dutch Oven! This one is getting googled some more for the next camping trip. I’d probably rather just cheat directly with hot cakes’ take ‘n’ bake for smaller portion sizes on cakes, but I think you might get a good stew out of the dutch oven instead. They even come with campfire directions! Safety Notes: on meat thermometers and a giant cooler on wheels..
-It’s definitely good to not poison yourself (see: safe cooking temps for meat). -Tried to store meats on the bottom of the cooler, separated by ziplocs for extra OCD-style care. -Tried to cook the more salmonella-prone items first, like eggs. 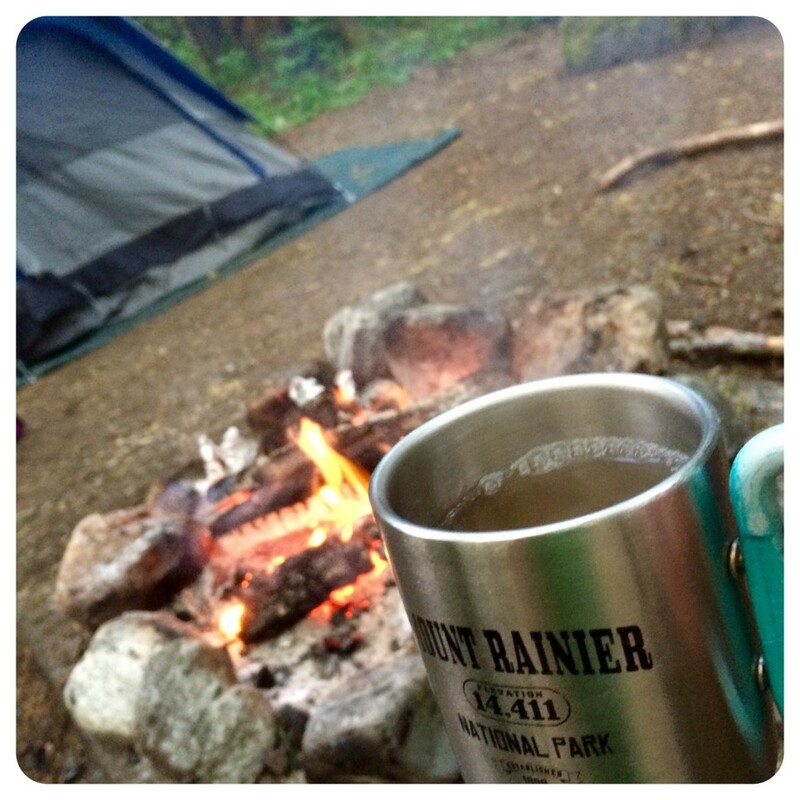 Relaxing with a hot toddy after dinner before getting in that tent. Salud! Questions? Comments? As usual, post below! Car Camping the Wong Way.. Choose Your Own Adventure Edition! So, maybe that 2nd hot toddy and the half a family size bag of kettle style salt & pepper chips was not the best idea, since now my health has declined significantly post-camping over the weekend. But anyway, I thought I’d put it to a vote of the readers: which of these would you most like to hear about, from my brief stint car camping in the North Cascades (least visited National Park in the Lower 48)? 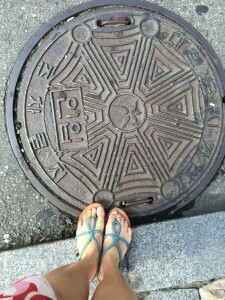 Polling closes in an arbitrary number of days from Thursday 5/13..
What would you like to see next on the blog? 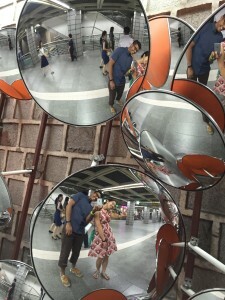 Remember that friend I mentioned who set this blog up? 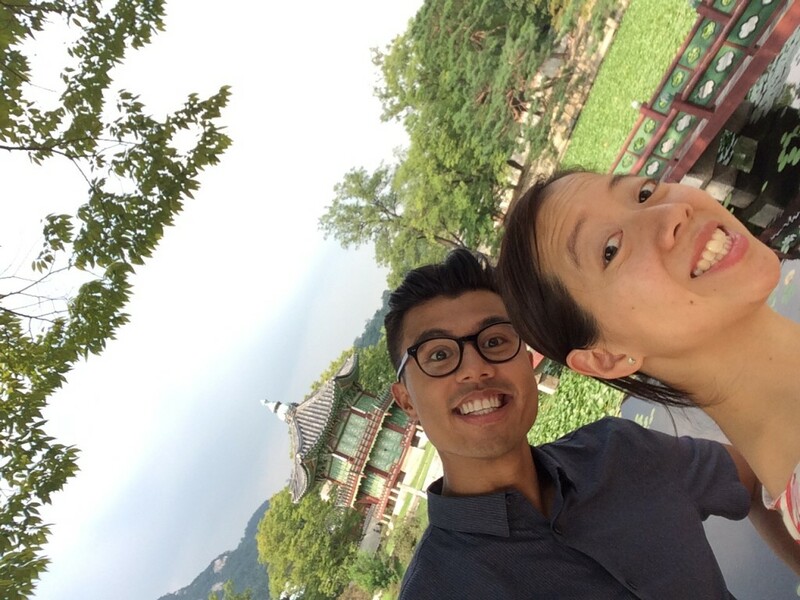 Check out J and K on Holiday, for a glimpse of his current adventures traipsing about Europe! 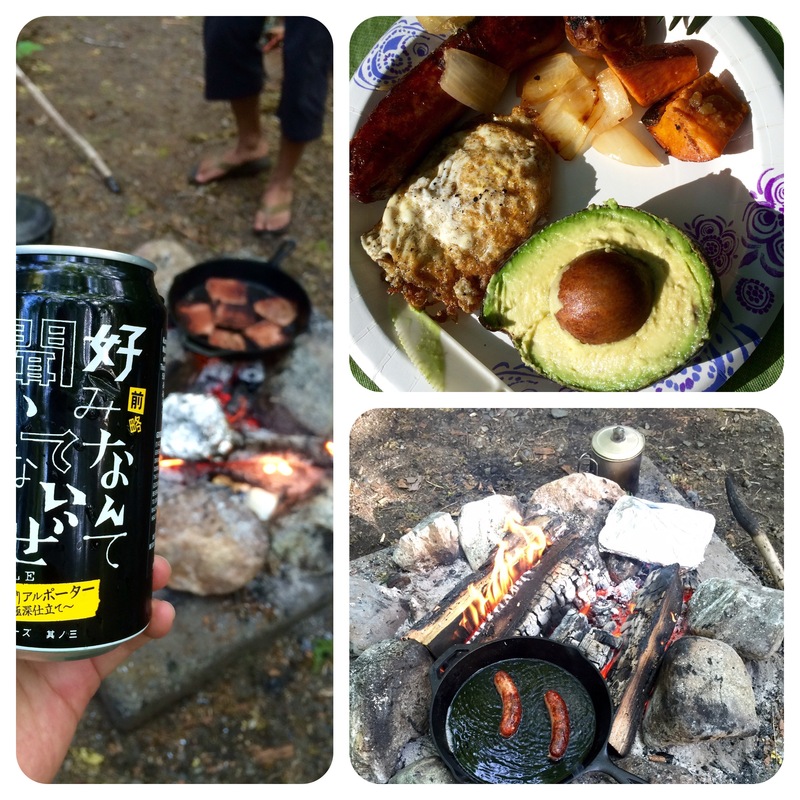 At the moment, they’re in France..
Spam Musubi – the best picnic sandwich ever! 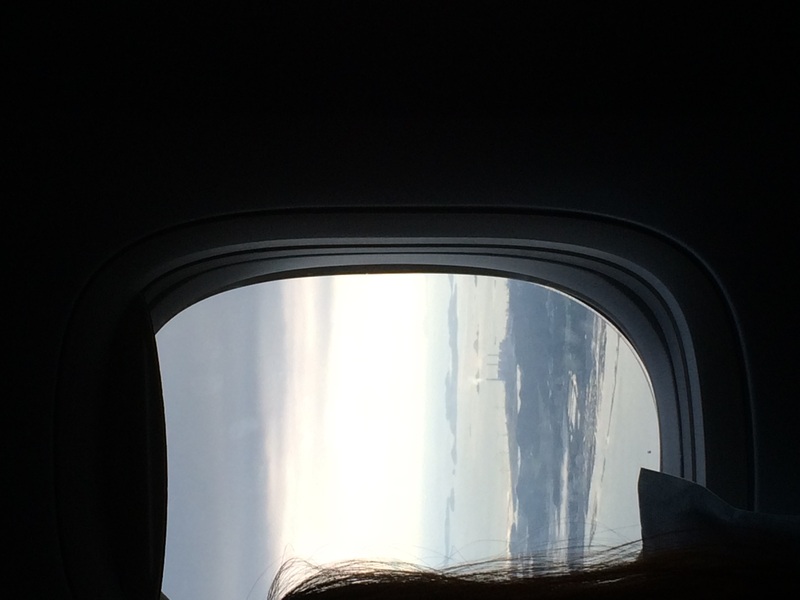 I used to think vacations to Hawaii were over-rated and so cliche (cheap flights from the west coast! All your co-workers are doing it! 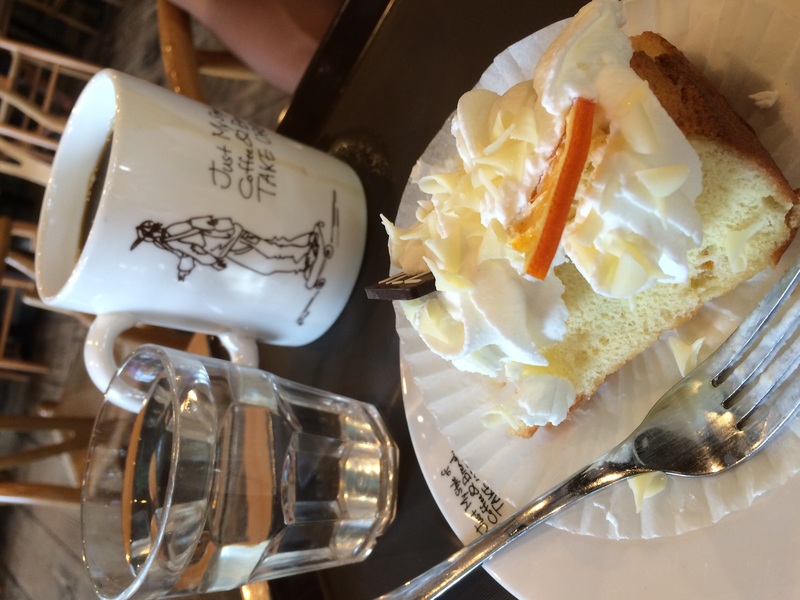 ), until i finally went. Then i realized why everybody in the Pacific Northwest tries to head out here in the Nth month of rain -it’s great! There’s a reason it’s a cliche. I hope some day you will feel about spam musubi just as fondly as Pacific Northwesterners feel about Hawaii. One of the great gifts from vacationing there was the delicious spam musubis. Entertainingly, the best ones were from a Shell gas station on Honoapiilani Highway, on the West side of Maui near Kaanapali -the one next to Maui Grown Coffee Store. Luckily, my co-worker grew up there, so he gave me in-person advice on how to make it extra home-made-delicious. So after I impulse-bought a musubi mold from the local Japanese grocer in town here, I was set. That link there was for one on Amazon, which will do just fine if you’re up for supporting the blog with your purchase. For my main proportion cues, I started with Two Red Bowl’s instructions. 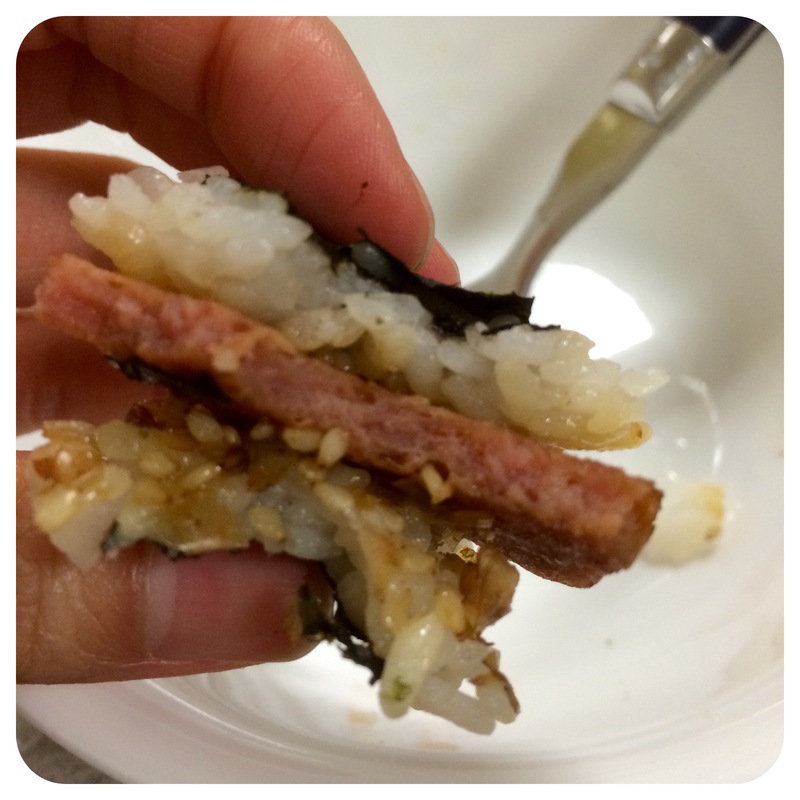 Spam Musubi – extra meat! make sure to get short-grained sushi rice. It’s sweeter! *0. 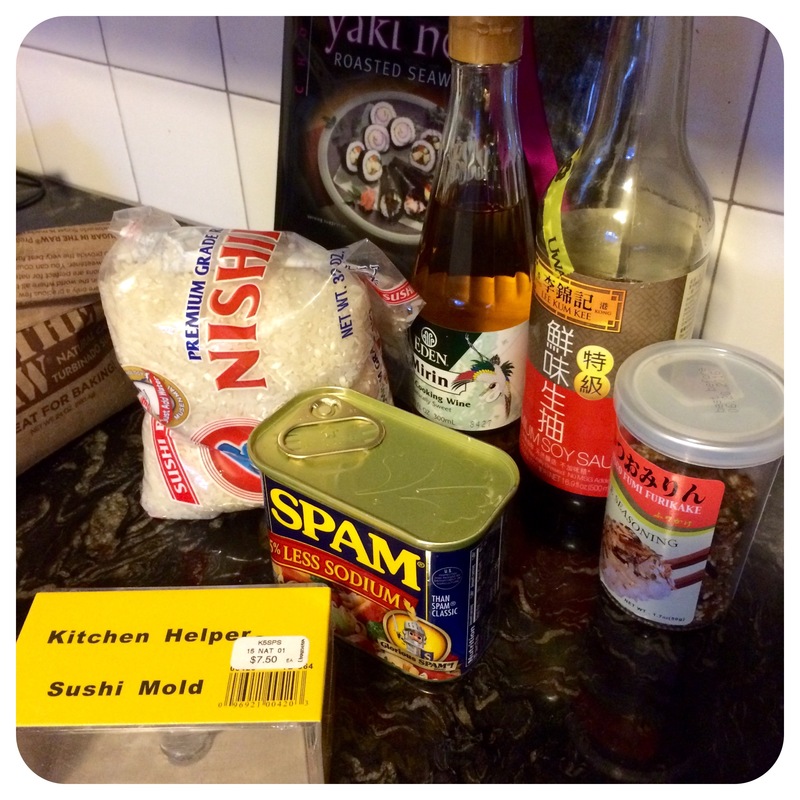 Early prep: cook sushi rice, mix in about 2 tsp rice vinegar for sweetness. 1. Slice Spam into 9 or 10 slices. Some prefer thinner slices, your choice. 2. Heat a skillet over medium heat, turning until nicely browned on both sides. 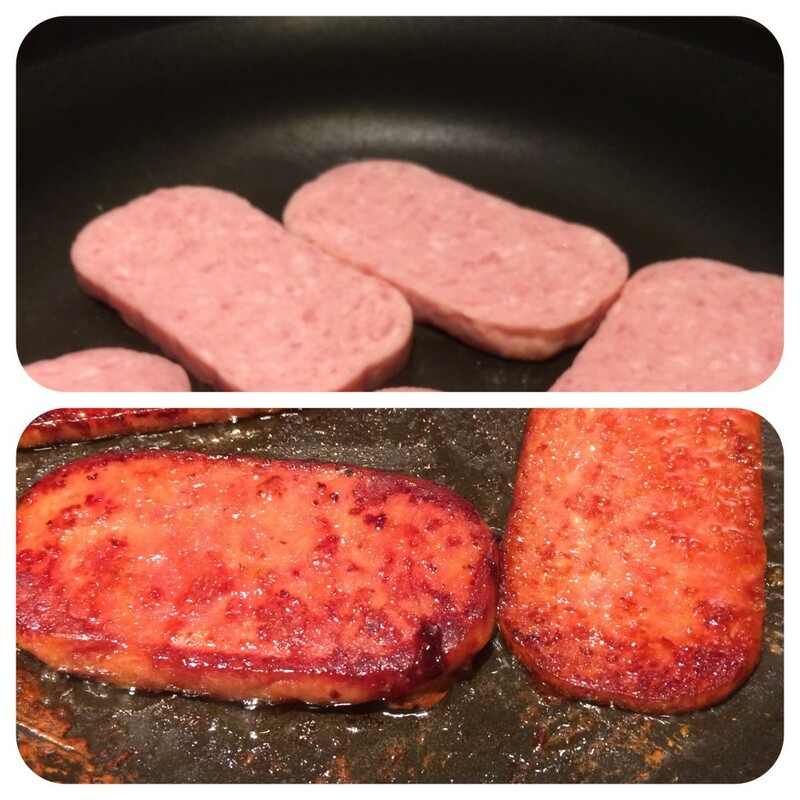 Spam at start and spam after saute and soy sauce treatment. 3. Turn heat to medium-low. Sprinkle sugar evenly over Spam, then pour in water-soy-sauce mix, coating each slice. 4. Turn heat back up to medium or medium-high, turning Spam slices until the water evaporates and Spam caramelizes. Turn off heat and set aside. 5. Once Spam has cooled, set up musubi mold, rice, furikake, and nori. 6. Press one slice spam, sprinkle with furikake, then press rice firmly into mold (pick the amount of rice to your liking), and for extra meat, top with another spam piece so everything fits right into the mold. Fill in any gaps in the corners of the mold with rice and press it all in again for good luck. 7. 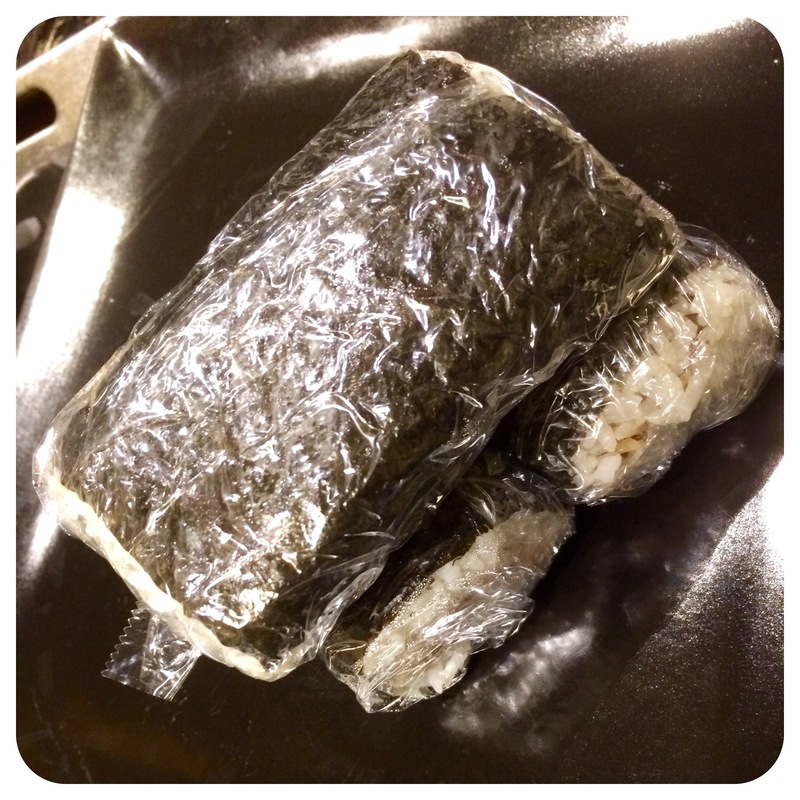 Fold nori tightly around the musubi. Use several grains of rice or a little water to seal the nori. 8. See storage tips below in Lessons Learned. I made you a gif, but WordPress wouldn’t let it work easily. So check the twitter feed.. Chef B’s What I Ate on Vacation entry. Novelty Rating: 5 of 5 stars. I don’t think I ever had spam until I had it in spam musubi. Mind blown. The hard part is not making it every week (or else you may be left with fewer weeks in your life from all the sodium and cholesterol). Lesson learned: These are definitely best when you plan to eat them the same day or the next day, so you can just wrap them in saran wrap and keep them at room temp (like for a picnic!). When you put them in the fridge the rice dries out, and while you can revive it a bit with a little time in the microwave, it’s not quite as delicious. C’mon, it’s spam, it’s meant to last. That’s right, for the few of you who may have puzzled at the last post, I was in Milan last week a few weeks ago visiting my good friends, J & G. A confluence of events created a last minute opportunity I just couldn’t pass up, despite the usual work pressures. Sleeping in on Monday was all the sweeter for having worked so much extra before. The last post was of delicious butternut squash risotto, compliments of J & G. There are few things sweeter than the hospitality of friends, in my opinion, and it’s even better when those friends are good cooks, as these two are! They even demonstrated in that last post that it is perfectly possible to cook a good meal with a kitchen the smaller than an American storage unit. Bam. How did I repay their generous hospitality in sharing a one-bedroom loft apartment with me and my spouse for a week? More, food, of course! A request for something somewhat light (and fast) was made, so I scaled down the portions of pasta (er, to what was in the pantry), and did one of my favorites -but only if you do it right: seared scallops. 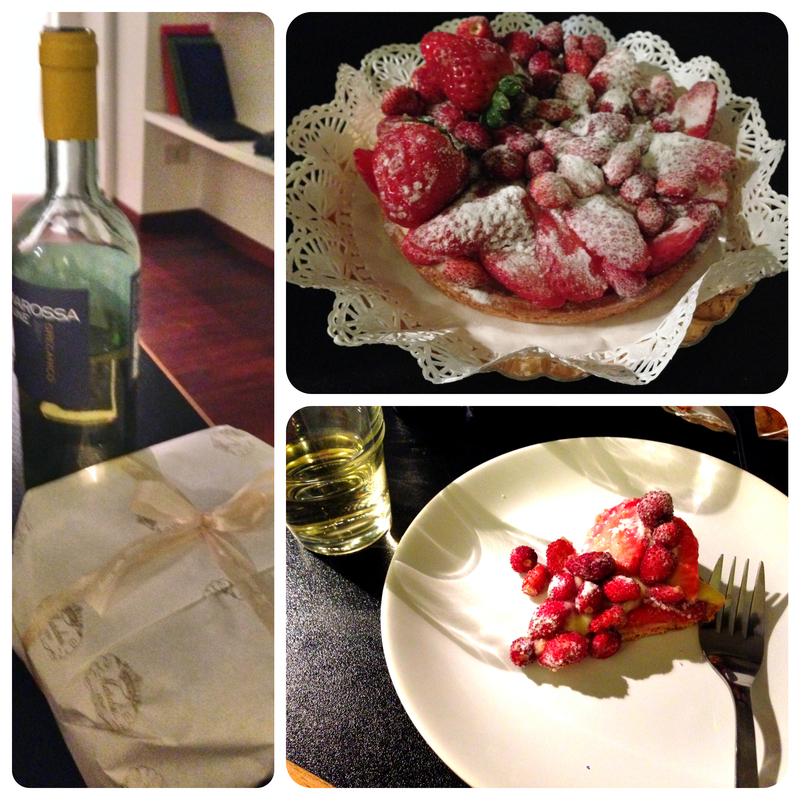 G did a great job slapping a salad together to go with, and we hunted up a delicious strawberry tart from pasticceria marchesi, a super old school classic pastry place. 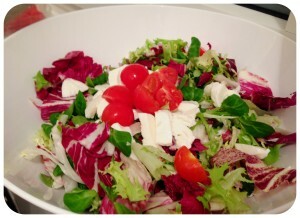 Thanks for the salad, G! Got the scallops from the local fishmonger, and I was stoked to find they delivered each precious scallop still attached to the shell. I’ve seen it on tv, but never found sea scallops sold this was in the states. They did appear to already have some guttiness removed, though, which was a minor relief. 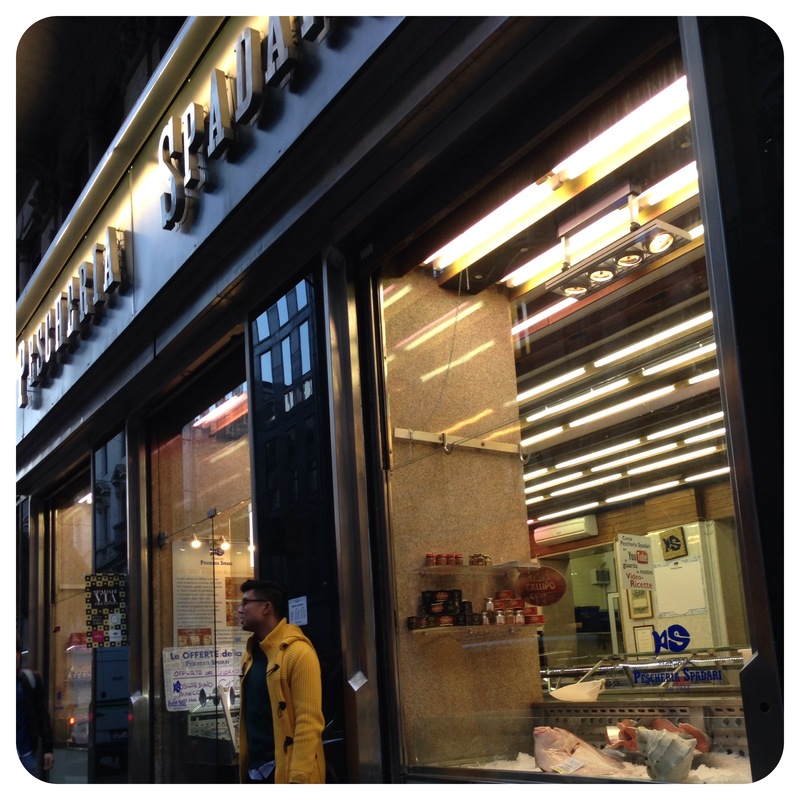 Pescheria Spadari: yummy seafood source! 1. cook angel hair pasta according to package directions in boiling water with 1 teaspoon salt; drain. 2. In small saucepan, heat oil and butter, stir in garlic, lemon peel, lemon juice, marjoram, salt and pepper, simmer 2 minutes. 3. transfer pasta to heated serving bowl. toss with oil mixture and parsley. serve immediately. Similarly, 8+ years ago I decided I only liked sea scallops when they were seared in butter and olive oil, and just barely raw in the middle. 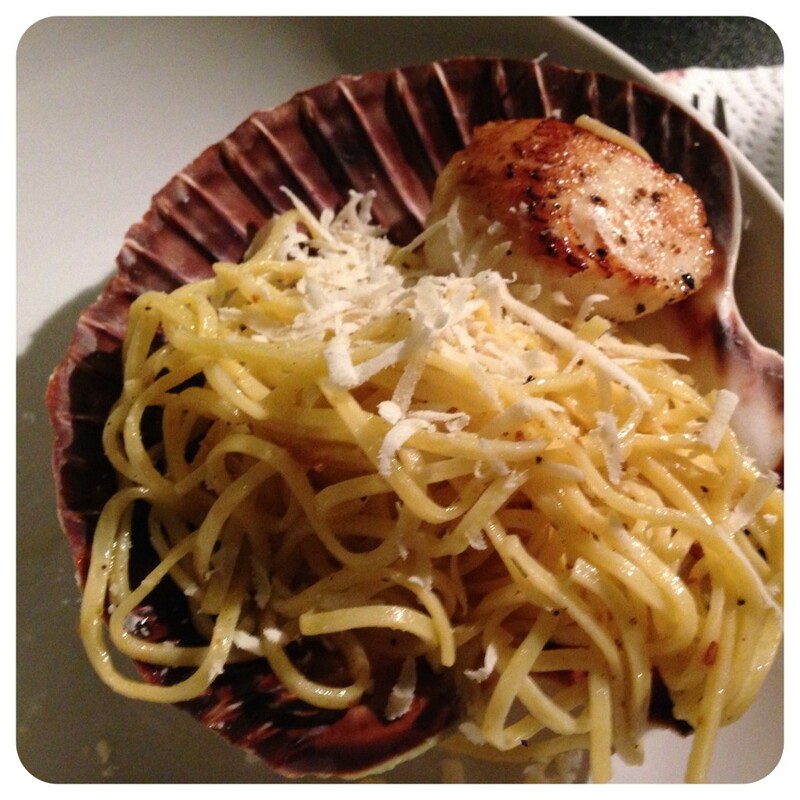 I found Alton Brown’s recommendations the most useful: click here for Alton Brown’s Seared Scallops recipe. In this instance, I had one extra (exciting) step, to cut the scallops off the shell, which wasn’t really challenging but still entertainingly novel. My only other advice to myself in my notes on this recipe is just not to get distracted, but resist the urge to move the scallop until just the right time for the 90 second flip, and then removal after the second 90 seconds. Any more time and you’ve overcooked them, any less and you may not get that delicious sweet brown crust. Voila! Dinner in ~under 30 minutes. scallops on the half shell!! lemon and pasta ingredients, scallops patted dry and prepped with salt and pepper for the pan, and finally: scallops in the pan full of butter and olive oil. Novelty Rating: 4 of 5 stars. 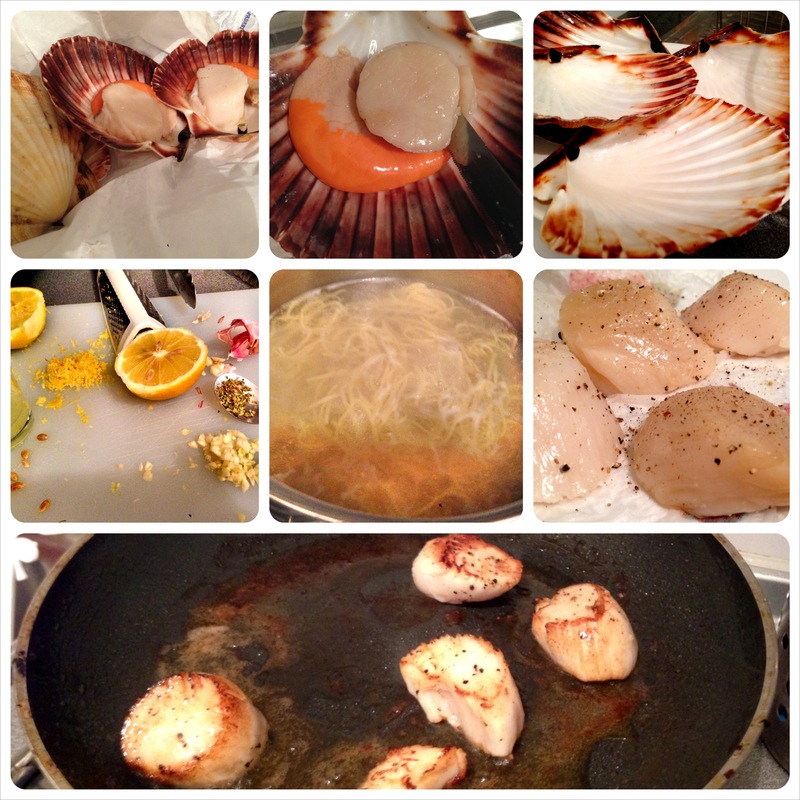 Very novel to get scallops still in their shells, and even better to serve it to friends living as expats. Some part of this will be repeated, the lemon garlic pasta has been good for meals for co-workers with new babies and it keeps well enough to serve cold at picnics. 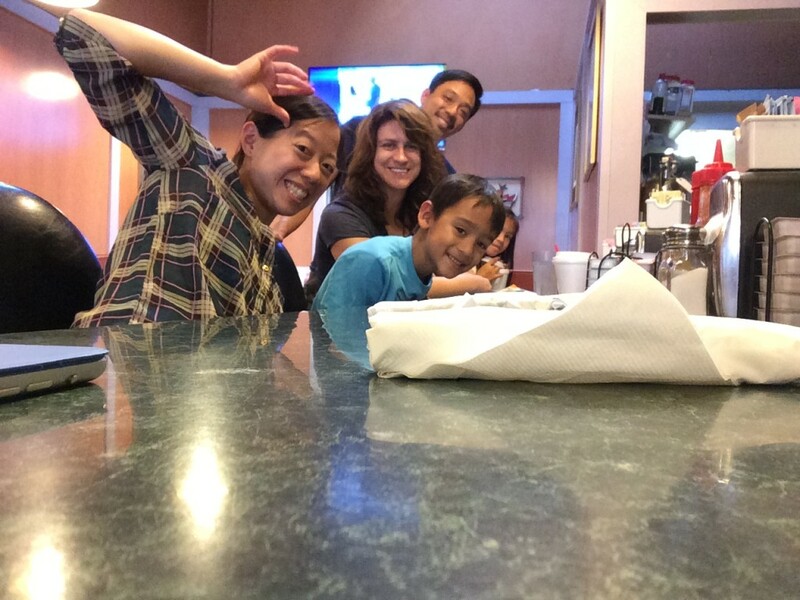 Lesson Learned: Umm…everything is better with friends? Delicious store-bought follow-up. I will be dreaming of this tart for years. The berries were small but packed with flavor. 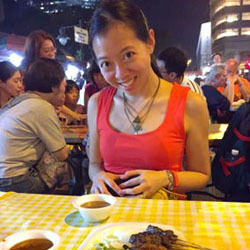 If you were to read this blog and walk away with one thing, I hope it’s a new food to try, a new cooking method or even a random fact that sparks your imagination to wonder at the world and brings us closer in our shared human heritage. 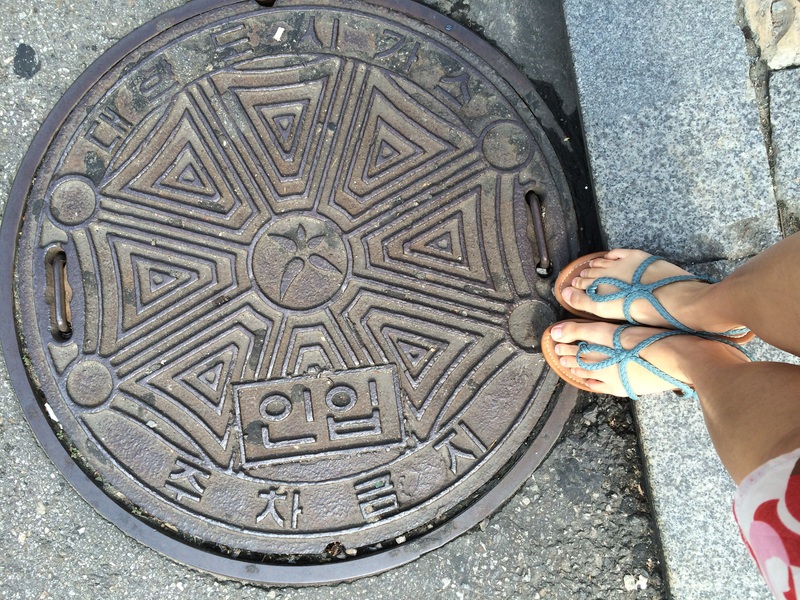 Sign up to get word the minute a new blog post is up! This list is not used for spamming or other shenanigans. © 2015 | Wordpress template by NUDGE MEDIA DESIGN.